Learn advanced .NET programming techniques by getting an insiders' look at a complete application! 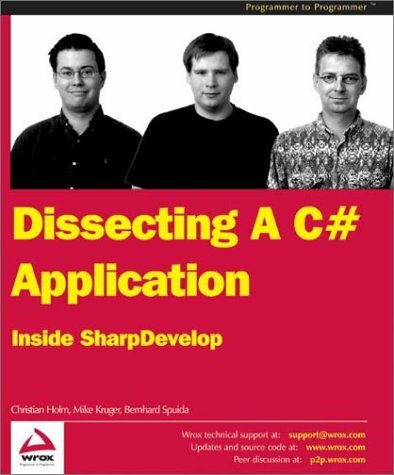 SharpDevelop is a complete Integrated Development Environment, written in C#. It includes all the advanced features that programmers expect from a modern IDE and, of course, implementing these features has required some advanced programming techniques. The developers who created SharpDevelop give you an inside track on application development with a guided tour of the sourcecode for SharpDevelop. They will show you the most important code features and explain how you can use these techniques in your own projects. You will gain valuable experience of building an application on this scale, learning from the decisions, mistakes, problems and solutions that lead to the current version on SharpDevelop. Author promotes object-oriented design using C# and illustrates the use of the object-oriented design patterns. The book shows how these patterns are used to create good software designs. Written for second- and third-year students. User-controls and the extensibility features offered by add-ins are probed in detail. The text covers controls-attributes, properties and events, creating a UI type editor, type conversion, designers, writing C# code, web controls, add-ins. Introduction to Visual Studio.Net and C#. The text covers working with the framework, building database applications, building Web applications, setup and deployment projects, the basics of C#, the C# code in .Net applications, C# and ASP.Net.